We use the state-of-the-art microprocessor based ORTHOPANTOMOGRAPHY X-RAY SYSTEM featuring a CEPHALOGRAPHY attachment to provide quality OPG scanning facility. 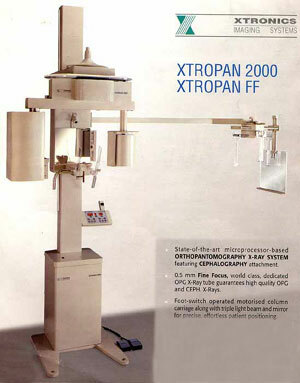 It has a 0.5 mm Fine Focus, world class, dedicated OPG X-Ray tube which guarantees high quality OPG and CEPH. X-Rays. Foot- switch operated motorized column carriage alonge with triple light beam and mirror for precise, effortless patient positioning.